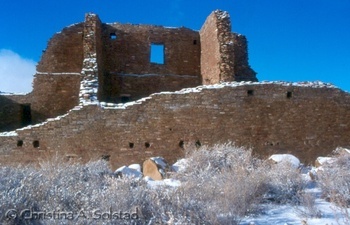 Perhaps my biggest realization came as I was nearing Chaco. I was in a particularly beautiful area, driving through a pass in the mountains filled with green trees, red cliffs, numerous hawks, and blue sky above. I was, at that moment, precisely where I was meant to be. I knew it. The Universe knew it. There was nothing else in the world I was supposed to be doing, or wanted to be doing, besides driving on this road. Sounds simple, but it was monumental for me. I had lived most of my life based on “shoulds” and other people’s expectations, rather than my own desires. I now felt completely at peace. 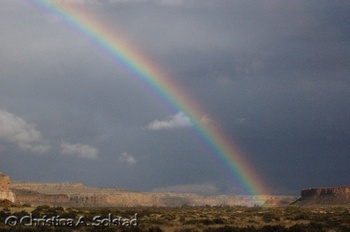 I took a deep breath and smiled as I turned down the dirt road to Chaco. It seemed an eternity since I left home yesterday morning. The Universe had already provided, and I had accepted, several valuable lessons. 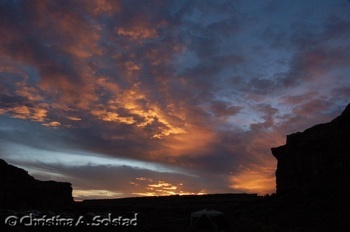 I entered Chaco a changed woman, for I had paid attention not only to the destination, but to the journey. What lay ahead could only be magic. The second day I chose to drive with no music, no tapes, no distractions. I wanted to use this time to explore me. As the miles ticked by on the odometer, I went back through my life. As I became acutely aware of the beauty of the wide open plains and the blue sky beyond the windshield, I also saw inwardly with a keen eye what I liked in my life and what I wanted to, and needed to, change. It all made so much sense out here. I saw that I had choices. And I consciously made some different choices. I was enjoying the long hours on the road alone. It gave me time to think, to explore, and to simply take in the expansive landscape full of Mother Nature’s wonders. Self-discovery, contemplation—we all need time alone to reflect and we rarely give ourselves that gift. But how could I do the same at home, when life seemed to just drag me along at times? I knew I just needed to make time—a walk, a bike ride, some time in nature. Combined with intent, small increments could be just as powerful. I breathed a sigh of relief as I got beyond the craziness of Los Angeles and out onto the open road. I pulled out my first tape—one my uncle had sent following his heart attack several years ago. He was full of appreciation for the brilliance of the sun, the green of the trees, the caring people around him, and the simple things. No longer was life a daily grind or something to be taken for granted; his words were a good reminder of the magic of everyday life. I took note and started thinking about my own life. The open road helped me to unwind and leave my daily cares behind. It was somewhere between Barstow and Needles, between my uncle’s tape and the relationship tapes, that I had my first big “ah-ha.” It seemed so obvious, why hadn’t I seen this before? I had spent much of my life feeling like I was doing something “wrong”—like somehow others held the key to the right way to do things. What if I simply changed my thinking—that I always did something right? What a concept! Driving alone, uninterrupted, was providing a new clarity to my thinking. This was my time, and I was loving it. 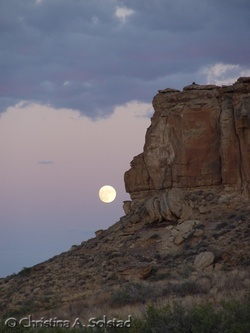 The long road trip to Chaco Canyon in northwestern New Mexico is always a great opportunity for introspection, letting go of day-to-day cares, and clearing your head before entering the canyon (always a good idea—more on that another time). 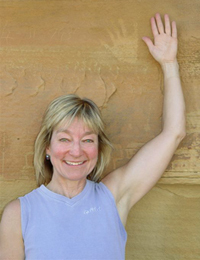 I'm heading off on a (long) road trip from San Diego to Santa Fe, New Mexico, and, of course, Chaco—so thought the following account was fitting. I'm posting it in four short parts over the next few days. The photo is one of many versions I have taken over the years of the amazing and beautiful Pueblo Bonito doors. 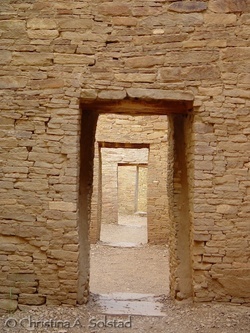 The ancient Chacoans were gifted architects and masons. Little did I know when I set out that mid-December morning what a journey I was embarking on. Oh, I thought I knew. I thought this was about spending a week at Chaco Canyon in the high desert of New Mexico—one of my favorite, magical places to visit. I had been there many times before, and I always came away knowing more about myself. This would be my first time alone. I wasn’t thrilled about the long, 15-hour drive without a companion. I had always had someone to talk to and share the driving with. I was the one who could usually manage only two hours at a time—in the daylight. Night driving and the long stretches were better left to my driving companions. My role was backup. So I came armed with plenty of tapes to keep me company and the resolve to take frequent breaks. The morning of my departure I was both excited and nervous. I felt this would be a special trip. It was still dark; the cold air was damp in my lungs. I shivered as I packed the final few things, with the help of my husband. I delayed leaving as long as I could. Something felt different today. He felt it too. His hug goodbye was longer; he pulled me a little closer. I watched him as I drove away, a funny feeling in the pit of my stomach—a feeling of anticipation. What would this trip hold for me?